(Natural News) Similar to how cigarette smokers suffer health consequences from the toxins that are carried into the lungs on particles of tobacco, a recent study has shown that tiny nanoparticles carry black carbon diesel fumes into the lungs of people who are exposed to them. Diesel fumes, commonly pushed into the atmosphere via the exhaust from heavy-duty trucks, are breathed in and reach the bloodstream through absorption into the lungs which can lead to heart disease – the world’s leading killer. Now, scientists have finally figured out exactly how these nanoparticles affect the cardiovascular system. The World Health Organization estimates that at least seven out of every 10 premature deaths caused by air pollution originate from heart disease and strokes. The majority of the rest of those deaths were linked to lung cancer and respiratory infections. Studying 26 human patients as well as lab mice, researchers at the University of Edinburgh, using medical imaging, tracked the path and final destination of gold nanoparticles that were purposely inhaled by the volunteers, some of whom were surgical patients. To the scientists’ utter surprise, the nanoparticles were detected in the urine and blood soon after exposure. Even more shockingly, the particles accumulated at inflamed vascular sites, including “carotid plaques in patients at risk of a stroke,” said the lead researcher. But wait, there’s more. The new research also shows that the dangerous diesel fumes entering the lungs on nanoparticles are damaging protective HDL cholesterol (the good kind) in the body, thus lowering it. This cholesterol is exactly what protects the heart and arteries. One study of more than 6,000 people who live in the United States showed their HDL levels plummeted after just three months of exposure to diesel pollution. This exacerbates other chronic health conditions like asthma, cancer and even dementia. Who knew? 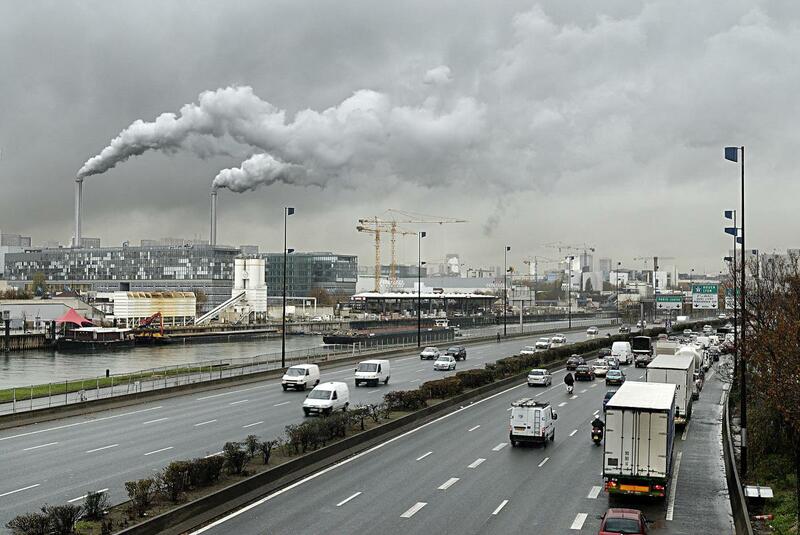 Black carbon particles and nitrogen oxides are emitted in high levels from diesel engines. This is a huge problem in Britain as well as the US, where half the cars are diesel. In America, diesel trucks haul 90 percent of the nation’s freight, flooding the highways with diesel exhaust and nanoparticles that find their way into our blood through the lungs of the people caught in traffic. In the metropolitan cities, buses and delivery trucks add to the chaos of air pollution. Cleaner diesel technology, especially since 2010, is reducing those toxic emissions, but not eliminating them altogether. Over 9 million US trucks, including most heavy duty 18-wheelers, are powered by diesel engines right now. By 2020, Exxon Mobil predicts diesel will surpass gasoline as the top transportation fuel. The propaganda surrounding this push claims that diesel fuel use will lower greenhouse gas emissions, but at what cost – human lives? Plus, since human-caused global warming is one grand hoax, who can put any faith in what huge fuel corporations claim as “beneficial” to the environment? The highest increases in diesel registrations are showing up in California, Massachusetts and Nevada, with year-over-year increases around 20 percent. Certain Western states, including Nevada, Montana and Idaho have the highest percentage of diesel vehicles on the road. Out of all 250 million US vehicles driving on roads today, more than 7 million of them are diesel powered, including large luxury SUVs, crossovers, vans, super-duty pickup trucks (Ford F-250 and F-350 lines) and even light-duty pickup trucks, like the Ram 1500 full-size pickup. That’s an increase of nearly 50 percent just since 2010. Are you being systematically dehumanized by the city? If you live in a metropolitan city or get stuck in heavy traffic commuting to work every day, maybe it’s time to consider moving to a rural area or finding a job where you can work from home. Eating clean food and drinking clean water is also of vital importance. Find out more about clean eating at CWClabs.com, run by the Health Ranger Mike Adams.